A panel discussed building social and intellectual life at liberal arts colleges. It may have taken place on two of Berkeley’s hottest days of the year, but last week’s highly successful C3-LADO visit to UC-Berkeley drew a huge audience of nearly 50 graduate student attendees! 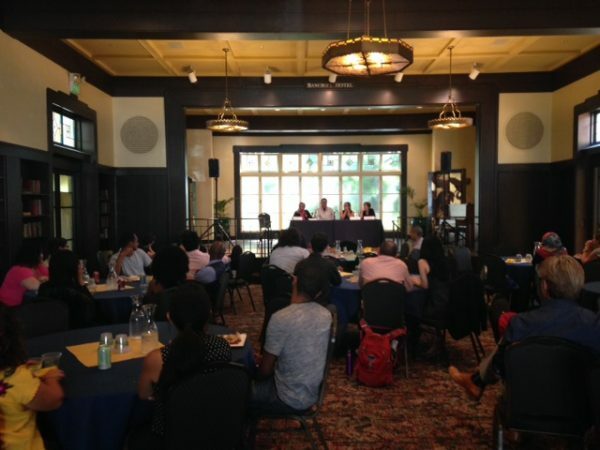 On September 26 and 27, 2016, UC-Berkeley hosted faculty and administrative representatives of C3 and LADO for two days of panels and workshops on topics of interest to graduate students soon to be entering the academic job market. Berkeley Dean of Arts and Humanities Anthony Cascardi welcomed faculty and graduate students to the event, which began with a panel on academic life at liberal arts colleges. Miguel Fernandez of Middlebury College moderated the discussion, which included Ngonidzashe Munemo and Christopher Goh of Williams College, Angelica Osorno of Reed College, and Abby Van Slyck of Connecticut College. They answered questions about tenure requirements, teaching evaluations, publishing expectations, and more. Berkeley Distinguished Professor of Social Sciences Rodolfo Mendoza-Denton delivered a powerful keynote address on minority students’ unique experience with self-doubt and self-esteem, touching on both his research and personal experiences as a faculty member of color. The first day of the visit concluded with discipline-specific workshops, in which liberal arts faculty met separately with humanities, social science, and STEM graduate students at Berkeley’s Multicultural Community Center. Students were able to ask questions related to interview formats, service work, and lab funding. 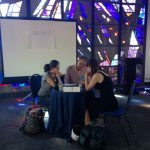 Individual and small group meetings gave students a chance to ask questions and get professional feedback. Interested graduate students from humanities, social sciences, and STEM fields met individually with nine liberal arts faculty members, who provided constructive feedback on the students’ cover letters and CVs. The visit concluded with a lively lunch panel of visiting faculty members who candidly discussed social and intellectual life at liberal arts colleges. Miguel Fernandez moderated a panel that included Sue Houchins and Kathryn Low of Bates College, and Ondine Chavoya and Brianna Heggeseth of Williams College.